Blue Plaque for Brighton Suffragettes? With many towns and cities marking the centenary of the 1918 Representation of the People Act with statues and plaques for their suffrage pioneers, it is not surprising that support is growing for a campaign to commemorate our Brighton Suffragettes with a blue plaque in the city centre. Hove already has a plaque to Victoria Liddiard, one of the last surviving Suffragettes, who died in 1992 at the age of 102. Emmeline Pankhurst and her daughters Christabel and Sylvia founded the Women’s Social and Political Union in 1903 in their home in Nelson St, Manchester. In May 1907 Christabel came to the Dome in Brighton to address a large gathering of various women’s societies and groups. This led to the formation of the Brighton branch of the NWSPU. It was one of the first to have its own banner in 1908, beautifully embroidered by members with the dolphin coat of arms. Last year I was privileged to see it behind the scenes at the People’s History Museum in Manchester. Very few have survived. 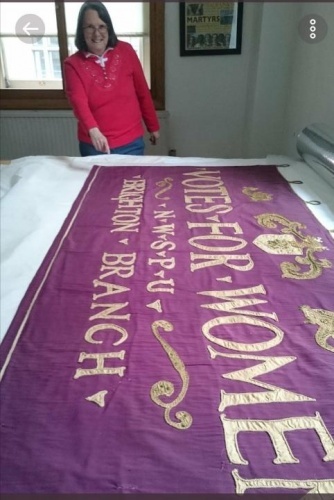 However, now Manchester has rediscovered its own WSPU banner, it would be exciting if the Brighton banner could be shown on display to the people of Brighton once again.. at least on loan. This postcard of early 20th century Brighton shows the location of the WSPU office. If you look carefully you can see it on the first floor above the machine bakery close to the Clock Tower. There was a banner with the letters WSPU on the wall. According to local street directories the bakery was at no 8, The Quadrant, North St, owned by Wm Wood. Estate agents, auctioneers, solicitors and accountants occupied some of the neighbouring offices. We know from the Brighton Gazette, this office was opened in May 1909. Until then the Suffragettes had held meetings in various halls but with the backing of professional women, they could afford more permanent premises and a library of suffrage books. They had paid organisers who included Isabella McKeown of Preston Drove and Mary Jane Clarke, sister of Emmeline Pankhurst. Sadly Mrs Clarke died on Christmas Day 1910, following her dreadful experience on Black Friday in Parliament Square and her subsequent imprisonment in Holloway. Miss Mary Hare became the Secretary in 1910 and was well known for spoiling her 1911 census form, as she argued if women did not count, then neither should they be counted. She went on to form a women’s police force in Brighton to protect vulnerable women and a school for the deaf which still exists today. Our WSPU office at the Clock Tower was one of the most important regional offices, organising events and demonstrations locally, eg on the Level, along the seafront and in London, having close links to the HQ at Lincoln’s Inn House in Kingsway. Many famous Suffragettes, eg Emily Wilding Davison and Annie Kenney, came down to recuperate at boarding houses, such as Minnie Turner’s Seaview in Victoria Rd. Another local Suffragette, Ada Schofield, had a studio in Dyke Rd where she took photos of many of the leading Suffragettes of the day, including the Pankhursts. High profile activist, Mary Leigh teamed up with Eva Bourne, a local woman to hide in the organ at the Dome planning to interrupt PM Asquith’s speech in 1910 but they were discovered by the police. However, another brave Suffragette, Emma Newsam, had a cunning plan. From 1908 women had been banned from attending political meetings, so she decided to gain entrance by dressing in her husband’s clothes with her long fair hair tucked up in a cloth cap. As soon as the anti-suffragist PM mentioned the word justice, she stood up revealing her hair and her long skirt from under her loose coat, demanding justice for women. Notices about our Brighton Suffragettes appeared in their newpaper under the Home Counties section eg in June 1913. “Miss Coomb’s meeting on Saturday was well attended. Many more papersellers are needed for the summer months. Will members please note there are several new books in the library. “ (Org. Miss Greta Allen)... who had been in that post from 1912. Army officer’s daughter, Arabella Scott was jailed after attempting to burn Kelso Racecourse. Released under the Cat and Mouse Act, she escaped under the pseudonym of Catherine Reid, and became an organiser in Brighton in August 1913. 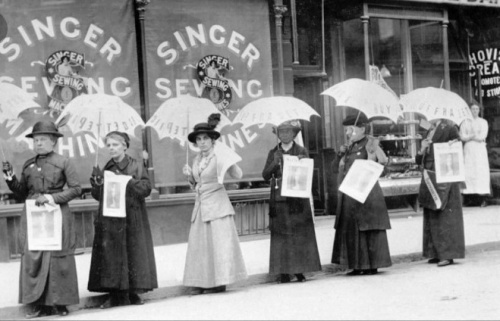 A Miss Reid is named in the photo of the 1914 parasol parade of Suffragettes selling their newspaper in front of the Singer Sewing Machine shop by the Clock Tower. Could that be her? With the outbreak of the First World War in 1914, the Suffragettes stopped their campaign. In 1918 some women were given the vote if they were over 30, and owned/whose husbands owned property worth £5. Other women had to wait until 1928 to gain equal voting rights with men, i.e. if over age of 21. There is so much to find out about our local Suffragettes. If you would like to know more, do follow our Facebook Brighton Suffragettes #Vote100 page and share with friends: bit.ly/2D7NQfZ That way you can keep up-to-date with our fundraising events eg Suffragette tours of Brighton with Karen Antoni; flash mobs and workshops for making your own banners and sashes with Friends of Westdene Green. One event not to miss is taking place on the evening of June 7 when Helen Pankhurst, great grandaughter of Emmeline is taking part in a panel discussion chaired by MP Caroline Lucas at Waterstones in Brighton in support of our campaign. Hope to see you there.